Somewhere along the line it was decided that every kit, be it an entertainment center or a laser cutter, would include a handful of hex keys. So pretty soon you’re drowning in the things, but of course you never quite have the makings of a complete set and invariably you’ll have duplicates of certain popular sizes. Since folks like us have trouble getting rid of anything in the first place, they just end up filling some dark and dusty drawer until there’s enough of them that they start planning an insurrection. To help quell the uprising, [Daniel] leveraged the parametric capabilities of OpenSCAD to create a fully custom holder for your collection of hex keys. By entering in the various sizes and number of hex keys you have into an array at the top of the script, his code will spit out a printable model that fits your exact specifications. So if for example you need to hold a half-dozen 2.5 mm hex keys, this design has got you covered. In a particularly nice touch, the script will even deboss the sizes of the hex keys right into the holder so there’s no doubt about which one is which. While admittedly a minor detail, this is an excellent example of the power of OpenSCAD, and is something that would be difficult to recreate with more traditional CAD tools. While he’s responsible for the parametric OpenSCAD code, [Daniel] didn’t actually come up with the original design for the hex key holder. That honor goes to [Alex Rich], who created a “static” version of the holder a couple of years back. That version was well suited for moving your store-bought hex key sets over to a slightly more ergonomic holder, but lacked any customization and relied on a printed (as in, on paper) label for the top to show which slot was for which key. Render of original hex holder design. That initial design was quite popular, and pretty soon [Alex] started getting requests for custom versions. He tried to accommodate the requests and put out different variations to the core design, but it was a losing battle. There’s simply too many permutations for one person to keep updating the design for each person’s scenario. He had put out the design because he thought others might find it interesting, not to take on a part-time job. [Daniel] saw the situation and thought it would be a perfect application for OpenSCAD. He recreated the basics of the design: a disc-shaped holder with various sized openings around the periphery, but also made some critical improvements beyond the parametric aspect. For one, the original design required support material inside the groove, but the new OpenSCAD version uses an angled face on the top side to remove this requirement with no impact on functionality. In other communities, this might be considered a “rip-off” and kick off some sort of flame war, but not here. [Alex] not only appreciated the work that went into the OpenSCAD version of his design, but now actively points it out to anyone who asks him for a custom version of the original holder. Since this is a customizable design, the first step is opening it up in OpenSCAD and making your modifications at the top of the file. You can enter whatever sizes you wish, but be aware there doesn’t seem to be any error checking in place. So for example if you enter in a size of 2.2 mm instead of 2.5 mm, nothing is going to stop you. The code is also surprisingly complex, so don’t be surprised if it takes up to a minute or two for OpenSCAD to generate your STL. Once you have your STL the design is a very easy print, and relatively fast. You can use higher layer heights to speed things up, but if you’re using the parametric version with the integrated sizes, the text might come out poorly. I printed it at 0.15 mm which struck a nice balance between surface detail and speed, and the holder finished in just under an hour and a half. After printing you need to provide either a rubber band or a suitable sized O-ring to fit into the grove. In both the original and parametric versions of the holder, the holes for each key are made loose enough that they won’t be retained from friction alone. The tension from the rubber band or O-ring is what actually holds everything in, so that the grip of the holder doesn’t degrade over time like it would be if it just used tight-fitting holes. In practice I found that O-rings work better than the rubber bands, even though the only ones I could find locally are actually much thinner than what the design calls for. When I tried with the rubber bands the keys had a tendency to get stuck on insertion, but it will certainly work if you can’t find O-rings big enough. Critics will say that the shape of this hex holder makes it uniquely suitable for traditional manufacturing: use a lathe to cut the O-ring grove into a piece of round stock, and then put it on the drill press to make the individual key holes. You’d lose the key sizes written on the side, but it would be faster to produce and much stronger than a piece of plastic. While all that’s true, we’re talking about thousands of dollars of equipment and the dedicated workshop to hold it all versus a cheap 3D printer in a hacker’s apartment. The point isn’t that 3D printing is always the only, or even best, way to produce these designs. But it’s absolutely the most approachable and affordable way to do it, and goes a long way towards democratizing the creation of custom physical objects. The O-ring is a great idea, (among other great ideas in this build). dunno, a decent quality set of ball end keys is 7 bucks at the horrible fright and they already come with a holder, I throw those freebee’s directly in the recycle bin. Kinda have to agree. I have two full sets of everything from 1/2″ down to 0.7mm. The rest I just keep in drawer as stock to make oddball tools, usually punches. I had a thought about Benchy yesterday, that I wish instead of the little tugboat it was a useful item, a household gadget, tool, something with universal appeal. That way after you’re done printing to isolate what issues to solve, you can give the ‘thing’ away to someone and they’d be all, “Yeah, this’ll be handy.” Rather than the huge armada of plastic tugboats ending up in the trash. Something like the above gadget. Something with real value. The cat code that comes with monoprice printers makes a surprisingly good bottle opener. But I guess just about anything makes a good bottle opener if you’re motivated…. I agree the idea isn’t new, but the fact that we now have a parametric version is. But what does being parametric accomplish? Now you just need another tool (specific computer software and a 3D printer) to handle the model so you can print a trivial piece of plastic. Meanwhile, if you really needed one in a pinch, you’d take any old piece of plastic and drill a bunch of holes in it, using drill bits of whatever size you please, negating the need for generating particular sized holes in software. I’ve wanted to learn OpenSCAD for a while, and this is a simple way to learn programmatic object design, nice when you have a real-world item to understand the logic. 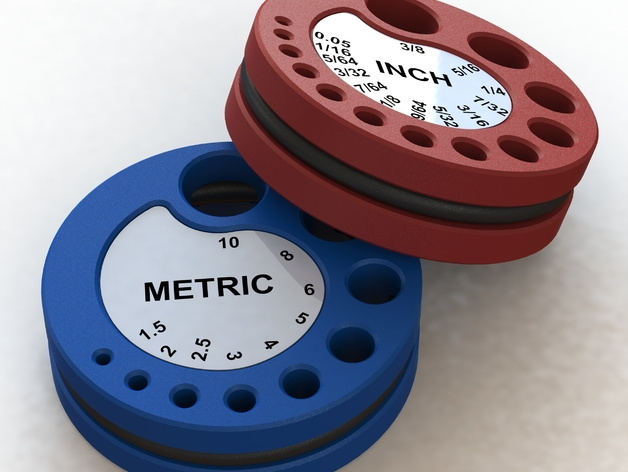 Parametric allows you to input parameters (three 5mm values, 6mm, 7mm, 8mm, 9mm, 10mm) and have it do the work of hole sizes, offset spacing and labeling, etc. Basically, what computers are good at, and humans aren’t. Any solution requires some input to get an output. This solution requires a 3d printer, and freely available software. Now, who’s got a solution to storing hex keys using a banana, an Olive Garden take-out container, an LED flippy and a spare HDMI connector? Extra Points if the design is solar powered. One of the weaknesses of the technology is that is utilizes plastic that generally isn’t sourced from recycled materials. So, 3-D printed doodads like this are missing an opportunity to create a re-use of existing waste materials. If you have a set of drill bits, the same thing could be made from just about any scrap waste material by drilling a series of holes that match the diameters of the hex bits. I’m afraid this project is still an example of trying to find a use for a device that melts plastic into shapes. Better applications of 3-D printing that would speak to the mission of this series would result in shapes that cannot be easily reproduced with simple hand or power tools. I used my 3d printer to make a cnc router. It also makes doo-dads that I could probably go buy at the store, but where’s the fun in that? Nice to see you didn’t bother reading the whole post. What are you supposed to do if you don’t have a drill press or even a dedicated place to work? You can get a 3D printer for $150 now that can fit in even the smallest one-room apartments. As for the recycled material, that’s a bizarre claim. Not only is most filament made of corn and biodegradable, you can readily set up a system were old prints are ground up and re-used as raw material. So it’s really the perfect technology if your goal is using recycled materials. So if an apartment dweller only had the room/budget for one tool, you’d suggest the subtractive drill press and its array of bits that can accomplish a single task (quickly) over an additive manufacturing machine that needs no accessories other than filament to make (slowly) nearly anything that can be imagined? Is this a serious suggestion? To me this is clear evidence of a mentality that just can’t move on from the old ways. Corn has the same issue as corn ethanol: food is really made with fossil fuels, from fertilizers to fuels and electricity to refine it. It takes a barrel of oil to make an equivalent amount of PLA, or thereabouts. It’s kinda like, people keep going on about how we should ban plastic bags and use canvas bags instead. Turns out, the canvas bag uses 40 times more oil to make, so if you bought the plastic bag and re-used it three times, that’s about a year’s worth of use for the canvas bag. Then, when the person who bought the canvas bag goes home, what do they use as the bin liner? Cover for their bicycle seat? Taking out the used kitty litter? Well, they buy plastic bags in a roll instead. The 3D printer is just like any other tool, you can use it to make other stuff. It’s no replacement for existing tools, it’s just another new tool. The 3D printer is a very versatile tool in many ways but also has it’s drawbacks. Though it may cause a revolution in DIY rapid prototyping it is in no way a threat to conventional tools, simply because in many ways some things can be made easier, faster or more accurate using conventional tools. The fun with 3D printers is ease of making another copy of your printed project. – the escalator never really replaced the normal stairs (even the superior elevators never really replaced the stairs, though it made higher buildings more practical). – books still exist today, event though we have all sorts of digital replacements for it. – ballpoint or pencil still exists, even though we have beautiful full color printers that can spit out multiple pages a minute. – television has made the need for cinema’s obsolete, yet they still exist. Try getting to the top of the Empire State Building using the stairs. Recycled plastic is unsuitable for many tasks, one of which is adhesion through heated extrusion. It does not bond as well. What may surprise you more, recycled plastic makes for ok WATER bottles, but is unusable for Carbonated or alcoholic beverage bottles. Both the CO2 and alcohol molecules (both isopropyl and ethanol) are smaller than the micro holes left in recycled plastic. Soda in a 2 Liter bottle will go flat in less than 48 hours in a recycled bottle, and alcohol will evaporate out. Recycling is a great idea in theory, but less so in practice. There are limits. Also, ADDITIVE manufacturing (such as 3d printing) has less waste than SUBTRACTIVE (drilling, milling, etc) where you need to start with a greater volume than the end product. Easy. Gaming terrain and miniatures. They are not easily made by hand OR traditional moulding methods as the overhangs and inner and outer model parts are difficult or impossible to cost effectively do. Right now, I can download free or buy cost effective .STL files and make a part at home. No longer does the product need raw materials shipped to one location, created, packed into wasteful blister packs (plus the energy for the sealing equipment, and the PTFE heat seal liner that has to be changed (and PTFE is terrible for the recycling stream) or clam shells, or plastic bags that add little to no value or end-use, that end up in a landfill, then shipped to me in a box that I need to reuse or recycle or throw out. So, I’ve eliminated how much fuel, printing, packaging, plastic, paper, glue and cut down or recycled trees and pulp scrap. I get a roll of filament, I print it, I paint it, and it goes on a table. Done. So there is an example.